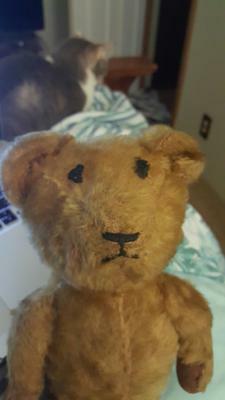 I have a vintage, jointed, growling teddy bear that we do not have enough information about. 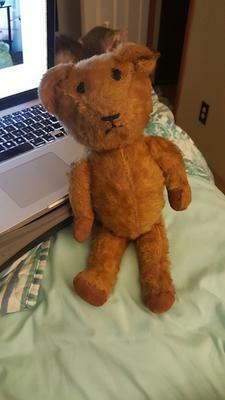 It has sewn eyes and a sewn nose, stitched pads as well (they are darker than the bear), and seems to be stuffed with something that is like straw or saw dust. It is something that is not soft. The hair of the bear is not soft either. It is scratchy and we think it is maybe mohair. My boyfriend's mother received it from a sister back in the 1940's as a child. The sister received it from a family friend who was from England, but they do not know if the bear is from England or not. The joints seem to be made of metal. The pads seem to be a canvas material. We are lost as to what maker it is by and what year it was made. We just know it is an old bear. The eyes could have been glass at some point, as could have the nose. They are now black thread and crudely done. The growler does not work, but you can press on it and feel it inside the bear. The bear is what is considered a blonde material, and we are not certain if it is mohair or not. It is scratchy and not very nice to cuddle at all, which would not make us want to take it to bed with us if we were children. We looked at Steiff Bears and Roosevelt Bears but still have not come up with what we believe it to be. 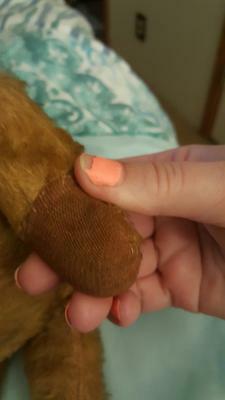 Any and all thoughts would be helpful as we would love to be able to tell my boyfriend's mother more about this bear. and is fully jointed at the legs, arms, and the head. The pads on the bear are a darker color than the hair on the bear. They are a medium to dark brown in color. The bear is light or blonde in appearance in color. Whether it is mohair or some other material we are not certain. The nose, eyes and mouth are all black thread. Everything is crudely stitched. We would like to take it apart to see how the growler is made, but do not want to destroy the bear itself. You can tell by pressing on the bear that it is not stuffed like a regular bear. It has a hard, almost dense feeling to the stuffing. We are not sure what the stuffing is made of, but have guessed straw, sawdust or some other type of dense material. The outside of the bear is very worn, so we are thinking that the bear is from the early 1900's or even before the 1900's. It could be from the USA or from somewhere in England or Europe. 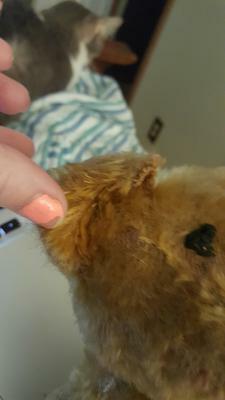 It was given as a gift, and is lacking a tag that we believe was located on the left ear of the bear due to a torn seam on the ear where you might think a child ripped the tag off. We do not know what price was originally paid for the bear as we said it was a gift given to my boyfriend's mother by her older sister, who was given it by a family friend who was not from the United States. We have tried many venues to figure out the origin of the bear but have not been able to reach any substantial conclusion. Your help would be greatly appreciated.